Surprise box, corrugata burl, katalox and European pear, 63mm high x 65mm dia. Curtain Box, maple, maple burl, cocobolo and black epoxy, 75mm high x 65mm dia. 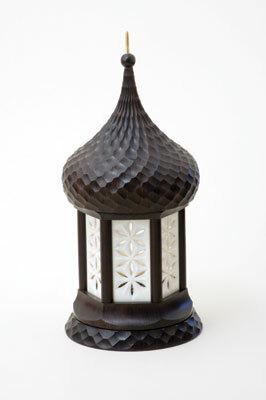 Gazebo box, African blackwood and ivory, recycled from old piano keys, 165mm high x 75mm dia. Bill Ooms was born on a farm south of Chicago in 1950. As a boy, he always enjoyed envisioning things and building them. This led him to a career in electronics with a bachelors degree in electrical engineering and a masters degree in computer science in 1972. His electronics career was in research - first with Bell Laboratories then later with Motorola. 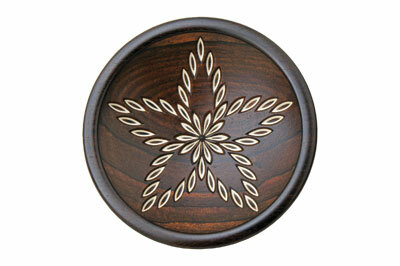 During his teenage years, Bill learned the basics of woodturning from his father. His career and family consumed most of his time, so woodturning was set aside for a while for many years. 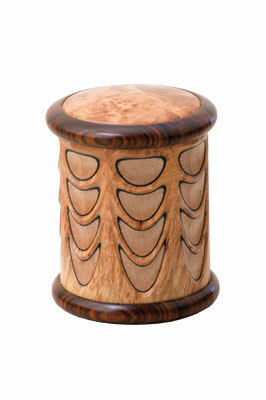 But once his son grew older he got back into woodturning as a hobby. He bought a small lathe and started making wooden pens. Having been promoted to management in his career, he no longer did design work and sorely missed the enjoyment of envisioning things and building them. "Making pens was a great way to get back into satisfying my artistic side and it was a great escape from the stress of corporate life," he says. After a number of years making pens, he was ready for something more and took a class from Mike Mahoney to learn how to make hollow forms back in 2000. "I found it useful to feel the outline of the work as the shape develops on the lathe - a practice I still follow today." Bill and his wife planned for an early retirement and in 2002 moved to Prescott, Arizona. By that time, he was selling his work at art shows and through selected galleries. After he retired, Bill was able to devote most of his time to woodturning. 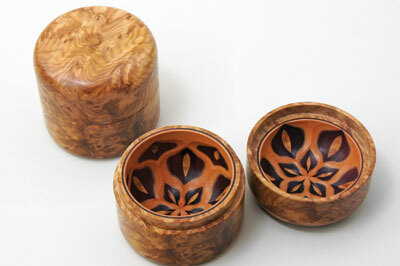 He cites this particular point as, "the beginning of woodturning as a second career for me." Bill describes himself as someone who has to spend his time doing useful things: "I can't imagine being in a situation where I could not be doing something productive. Yes, I like to relax and read books and watch movies in the evenings, but I need to be doing useful things to feel that my day was spent wisely. Most importantly, I always enjoy learning new things. I can't ever imagine a day will come when I'm not reading and learning something new," he says. Bill's style has evolved significantly over the last 15 years as his skills developed. He advises turning pens as a wonderful starting point for anyone: "My favourite pens were made from wood with natural voids such as jarrah burl (Eucalyptus marginata) and I filled the voids with crushed turquoise." He then progressed on to making hollow forms. His main influence during this period of time was the Native American potters as mentioned. He was attracted to the simple elegance of the shapes. "To me, the shape and form is most important. The beauty of the wood and any additional adornment comes after that. Nice wood with a poor shape is still poor art to my thinking." When the point came where a lot of people were making hollow forms, Bill started to look for a direction that would be different. 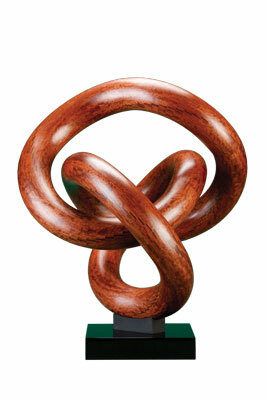 He was introduced to the concept of segmented sculptures by Malcolm Tibbetts. "Here was a unique kind of work that required some math skills and planning - right up my alley with my engineering background," he explains. Bill pushed the limits of segmented sculptures by writing his own computer software to plan and visualise the work. The computer allowed him to visualise the work from all angles to present a pleasing view from any angle, and make small adjustments to the proportions long before he started making sawdust in the shop. Most of these segmented sculptures took four to six weeks to build, the largest one took about three months. These sculptures were very modern - a difficult transition from very traditional Native American pottery shapes to something modern and abstract. Bill spent a lot of time looking at other kinds of contemporary sculptures, and talking with other artists about their work helped him to gain a better understanding of contemporary sculpture. "I would always attempt to make sculptures that I would call - flowing and elegant. Segmenting wood permits one to get carried away with too much visual complexity, which I personally find distracting. I want the eye to see the shape first, then the wood, then any patterning from the segmenting which must complement the overall work." Sawdust and allergies began to take a toll on Bill's health - even wearing a full respirator in the workshop was not enough to prevent problems. There was too much sawdust generated making the larger sculptures, so Bill made a switch to smaller work. He was introduced to ornamental turning by Jon Magill and Bonnie Klein: "What appealed to me was the need for careful attention to detail and the complexity of the work," he says, "it is a long learning curve." It took years before Bill was comfortable showing and selling ornamental work. Having started with a simple MDF rose engine, he soon found himself wanting something with more precision and more capability. He was unable to afford one of the great Holtzapffel machines - even if he was lucky enough to find one - or one of the modern day equivalents. So he decided to design and build his own machine incorporating modern technology such as linear bearings, stepper motors, and computerised circuits. The goal was not for mass production, but rather a flexible hands-on machine that allowed him to bridge the gap between what he envisioned and what he made. The electronic control allowed him to make minute changes in the virtual 'rosettes' so that each cut pattern would blend with the overall design. It also allowed him to make new kinds of cuts that were not possible with the traditional analogue machinery. Bill's ornamental style is continuing to evolve: "My goal is not to make pieces that have too much distracting ornamentation over the entire surface. Rather, shape comes first, then wood and ornamentation." Bill always aims to achieve the balance between simplicity, elegance and the appeal of the wood complemented by the ornamentation. His work has changed a lot over the years and he has no plans to buck that trend: "I'll continue to change; I don't want to be stuck forever in one small niche. I understand that many talk about the importance of 'signature work', but I just get bored when I do too much of one kind of work." However, Bill's current work is built on the foundation of all the work he has done in the past. The solid experience in segmented sculptures is a good training ground for the precision required to piece together some of the complex ornamental work, and his experience with hollow forms allowed him to branch into ornamental work on hollow forms. Bill explains, "it's difficult for me to encapsulate my style into a short description. Yet, when I post a photo of a new work on one of the internet forums, people often recognise it as one of mine - I guess I would say that I strive for something that is elegant. I don't like overdoing it with too much decoration; I push the limits of precision and attention to detail." He also likes to take plenty of time to create his pieces: "f it takes a few hours more to get some part of a curve just right, then that's what it takes." Bill applies all of his background as an engineer to plan the details of the patterns he incorporates into his work. "I feel good when other experienced turners say 'how did you do that?'" When it comes to ornamental turning, Bill is of the belief that the decoration must fit the artwork. He advises: "Don't start with the rosettes you have and design a piece that can use those rosettes. Rather, envision the piece of art." "Looking at fine artwork from others is always an inspiration. After coming home from the recent AAW Symposium, I found my mind full of new ideas inspired from the work of others in the instant gallery." Bill also often looks through the glassware in stores looking for shapes that catch his eye. "Sometimes the simplest things can be a source of inspiration," he says. Bill is also interested in J. Paul Fennell's approach of directing people to books on creative photography, and learning to really look at what your eye is seeing. "The book Photography and the Art of Seeing by Freeman Patterson was a real treat. I often spend time with a camera just looking closely at common objects I encounter.â€ More recently, Bill was encouraged by Jerry Bennett to think about what you want to make without worrying about how you will make it. His recent 'Vase with a Shawl' germinated from that comment. "It took some time - and some failures - to figure out how to make what I was seeing in my mind's eye." More recently, Cindy Drozda continues to stress the importance of small details. Bill's brother, Bob, is also a woodworker and he and Bill spend a lot of time critiquing the fine points of each others' work. "I think that everyone needs a few people who will give you honest and constructive critique and push you to a point beyond where you would feel comfortable on your own." Recently, Bill has been intrigued by the delicate layered work of Dale Chase: "When he died a number of years ago, he took a lot of secrets to the grave," Bill says, and he is fascinated in learning to reinvent the techniques for thin layers - or in some cases inventing new techniques - and then using that to push beyond what Dale did to apply the concepts in new ways. Dale's work cut through layers on flat or cylindrical layers, Bill goes on, "I'm now pushing beyond that to do layering on curved surfaces and cutting through those curved layers with the ornamentation." "My workshop is not the most elegant - I often tell people 'it's not a studio, it's a shop.'" Several years ago Bill graduated from a single car stall in his garage and built a barn to house his new shop. The main shop portion is 24 x 24ft - about the same as a two car garage - with additional separate 12 x 24ft space for wood drying and storage. His main turning lathe is a Woodfast that he's had for about 12 years. The ornamental lathe is built on a foundation of a Jet 1220 mini-lathe, which he uses for plain turning as well as for ornamental work, allowing far greater precision because he doesn't have errors from misalignment that one often gets when transferring work from one machine to another. 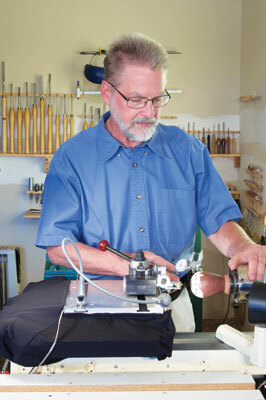 He still has his original Carba-Tec mini-lathe that he started with many years ago. "There are a few things that you don't normally find in other people's wood shops. For example, I have a small metal lathe and a small milling machine. These are great for making the specialised fixtures and cutters needed in ornamental turning. However, I also use the metal lathe for turning wood. This gives me the precision I need for certain kinds of work." Bill also has computers in the shop: "Visualising my work in advance is a most important part of my design process. That's how I can come up with new and unique patterns in my ornamental work." He explains that it is much easier to try a dozen designs in a few minutes on the computer than to cut wood on those same dozen designs. One thing he intends to add to the shop is a few skylights to let in more natural light. Bill decided some time ago to do what he enjoyed rather than doing what was profitable. Instead of getting up in the morning and planning how many things he needed to make that would sell at a profit, he gets up and plans something creative and enjoyable. "As I look back over the last year, I can see some significant progress on my journey of creativity." Asking him about the future, Bill explains he aims to keep progressing: "I'll continue to go where my creative vision leads - it's not about profit any more." And Bill is also keen to share tips with other turners: "I've made the decision to tell anyone the details of how I do things. I don't have to fence off secrets to preserve some territory for personal profit." 5. I almost always plan my work in advance. This can be as simple as a sketch of the cross-section of a box with the dimensions, or it can be more complex and include a computer simulation of the surface ornamentation. There are a variety of simulation programs available to woodturners ranging from Google Sketchup - free - to more specialised programs for segmenters. Some of the programs that I have written for my own use are available to others including the free BowlShape software for visualising the shape of a hollow form.